A gas leak smells like rotten eggs, a skunk’s spray, or a dead animal. It may sound like Hissing, roaring or whistling. Or you can see the damaged connections to natural gas appliances or vegetation that is dead or dying for no reason. A natural gas leak is dangerous because it is poisonous and it can explode. Step 1: Leave the area immediately on foot. Step 2: Call your propane company or 911. Step 3: Warn others to stay away from the leak. Don’t use a telephone or cell phone. Don’t operate any electrical appliance. Don’t turn appliances or light on or off. Don’t smoke or use lighters or matches. Don’t use elevators. Move on foot. Don’t attempt to put the fire out yourself. Don’t start any motor vehicle while in the area of a possible gas leak. Turn off the main gas valve, if possible. Call your propane company or 911. Never assume someone else has already called tto report a natural gas leak. Don’t go back inside your home or building until your propane company says it is safe. Before you attempt to reuse any propane appliances, you must check your entire system to ensure that it is leak-free with your propane company or a qualified service technician. 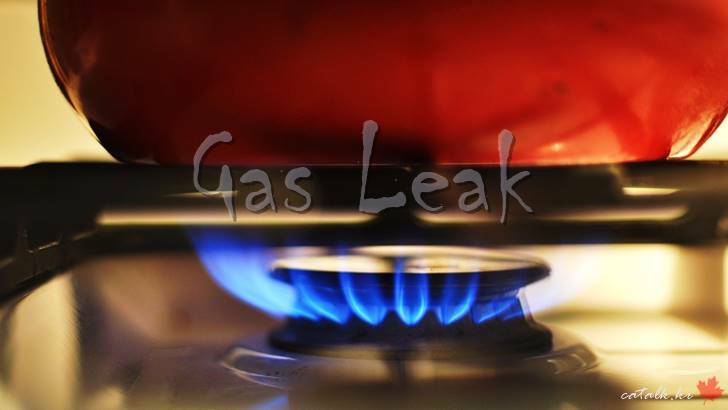 Make sure you and your family konw how to recongnize a gas leak and what to do if you suspect a leak.